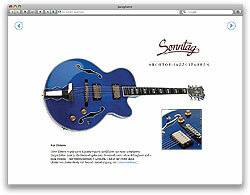 The gallery offers a chronological overview of the development of the Sonntag Jazz guitar models. This photo series shows how today's archtop models crystallized in the course of time. Use the arrows on top of the pages to navigate.